Part Thirteen, the last of a monograph by Ramaprasad Chanda, published by the Archaeological Survey of India, 1998. In our fragment, the absence of any case-ending after mahasthana shows that it is part of a compound word, the other member of which is lost. If I am right in guessing that this lost word denoted 'shrine', to which the four buildings enclosing the quadrangle (chatuhsalam) were attached, mahasthana may be understood to denote a spot sacred to the memory of Krishna-Vasudeva. According to the Mahabharata, the Puranas, Bhasa's Balacharita and other Brahmanic works, Mathura is the birth place of Krishna-Vasudeva and the scene of one of His most important feats, the slaying of Kamsa. 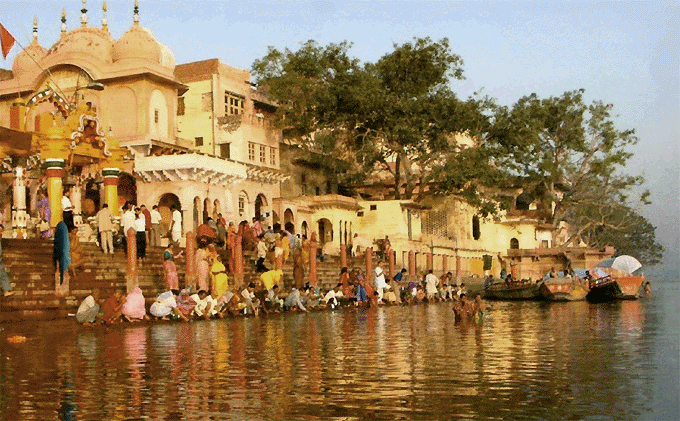 Mathura is still held holy as the janmasthana or birth place of Krishna-Vasudeva. A spot near the modern temple of Kesavadeva marked by a small cell is held sacred as the prison house of Kamsa, where Vasudev and Devaki were confined and where Krishna was born. The prevalence of the custom of making pilgrimage to the thanani (sthanani) or places connected with the life of Buddha in the reign of Asoka on the one hand, and the prevalence of the worship of Samkarshana and Vasudeva in the second century B.C. on the other, warrant us in assuming that the Mahasthana of Vasudeva at Mathura did not suddenly become popular in the time of the Saka satraps, but must have been a place of pilgrimage long before their rise. The statement of the Megasthenes that the Sourasenai who lived in and about Mathura held Krishna (Herakles) in special honour lends support to this view. The Vaishnava monuments dealt with in this Memoir all together make up a mere handful as compared with the number of ancient Buddhist monuments, and the earliest of them is more than half a century younger than the earliest Buddhist ones. So these few comparatively late archaeological documents can hardly be expected to throw as much light on the growth of Vaishnava traditions as the Buddhist monuments do on those of the Buddhists, and the conclusions set forth above are necessarily tentative in their nature. But these few documents appear to be sufficient to create a belief that the excavation of the ancient sites of Western and Central India, and particularly those of Besnagar and about Mathura, will reveal more materials for the early history of Vaishnavism. Memoirs of the Archaeological Survey of India No. 5., 'Archaeology and Vaishnava Tradition' by Ramaprasad Chanda.